Taking care of your skin at every age is crucial to looking and feeling your best. If you notice significant, sudden changes in the appearance of your skin, always visit your dermatologist. The aging process can affect the body in so many ways. Throughout your life your skin will have numerous natural changes. The severity of these changes can be influenced by lifestyle choices such as smoking, diet, exposure to the sun and harsh environments and genetics. An aging or elderly persons skin does not just change in appearance, but it also requires some special care to keep it healthy. Although you cannot stop aging, you can learn ways to take care of your skin as you age and help avoid the complications discussed above. As previously noted, the best defense against the damaging effects of time is to maintain healthy skin. Healthful food, adequate hydration and general physical fitness are the best ways to ensure overall health. Please always make sure you consult a physician for any medical questions or concerns. As skin ages it becomes naturally thinner, as much as 20% thinner. Elderly skin injures more easily, heals more slowly, is prone to bruising, and can tear and bleed from even minor injury. Be more aware of how delicate the skin can be, maintain a healthy diet, keep skin moisturized and stay hydrated. All of these things can help not only to keep from having skin tears but they can also help with the healing process. Remember also to watch for infections in the areas of concern and consult a physician immediately if a problem arises. The main cause of skin cancer is sun exposure. Sun damage and ultimately skin cancer is caused when the ultraviolet or UV rays of sunlight break down the elastin or elastic tissue in the skin which causes damage and possibly even cancer. Sun damage cannot be reversed. However, further damage and skin cancer may be prevented in the following ways. Always use sunscreen with SPF 15 or higher. The sunscreen should have both UVA and UVB protection. Wear a hat, sunglasses, and long sleeves whenever possible. Avoid sun exposure between 10 AM and 4 PM when the sun’s rays are the most intense. Get any new growths or suspicious changes of the skin, seen by a doctor immediately. Thin skin tends to be drier than healthier skin with a layer of protective fat underneath. The skin is more prone to wrinkling and scaling, leaving an uncomfortable dryness and itching. Dead skin cells don’t slough off as regularly as the skin becomes dry and thin with age, report doctors at the American Academy of Dermatologists. Collagen and elastin production slows down, making skin drier and less pliable. In addition to the discomfort of extremely dry thin skin, many seniors become upset at the appearance of their skin. The two most common causes of lines and wrinkles are sun exposure and smoking so avoiding these things is really the best prevention. Lines and wrinkles can be treated and their appearance reduced by staying hydrated, using moisturizers and using medications prescribed by a physician and specifically a dermatologist. Pressure ulcers are common among elderly that have limited mobility. 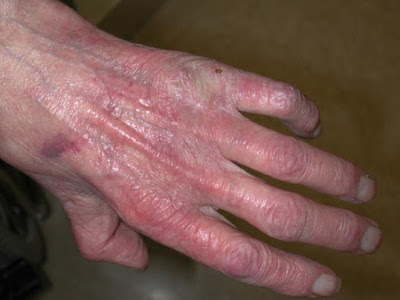 Also called bed sores or pressure sores this skin problem forms when the elderly sit in a chair or lie in bed for extended periods of time without proper movement. Sitting or lying down for a continuous period of time limits the blood supply to the skin causing a painful (often time’s reddened area) that can eventually darken, break open and becomes at risk for infection. Prevention includes frequent position changes, inspection of the skin, proper nutrition, quitting smoking, daily exercise, and enhancing circulation through therapeutic massage. One purpose of the skin is to protect the body from environmental damage like hot plates and sharp objects, report researchers at the University of Florida. When the layers of fat are reduced and the skin loses its high level of nerve function, seniors become vulnerable to damage from outside sources they may not feel in time enough to remove themselves from danger. Burning from heating pads or hot water can cause damage if not felt in time. Thin skin reduces the protection provided by healthy skin and leaves seniors with a greater sensitivity to cold and drafts. Sweat glands are reduced in people with thinner skin and results in a decrease of body temperature control. Seniors can become more uncomfortable in very hot climates since their skin does not produce the sweat needed to cool off the skin. Emotional stress also affects the skin - just notice how anger or embarrassment can make your face turn red. Physical stress is caused by exercising too much, working too much or straining the body over a period of time. Like mental stress, this causes the drying out of skin moisture resulting in rough, aged skin. Stop whatever work or exercise is causing the strain. 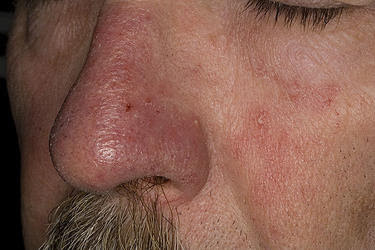 Also referred to as liver spots, these brownish splotches are common amongst the elderly. These spots are caused by accumulated sun exposure over a lifetime. They occur most commonly on the face, hands, and forearms. Prevention involves using sunscreen when in the sun, wearing long sleeves, wearing a hat, and avoiding sun exposure. There are many effective treatments for removing age spots. These should all be performed by a medical doctor and include laser treatment, chemical peels, microdermabrasion, and cryosurgery. Follow a healthy skin care regime. Pay as much attention to the skin below your neck as you do to your complexion. Bathe with warm water, not hot - it’s not as drying. Use a gentle body wash or soap-free cleanser to avoid stripping the skin of its natural oils. A rich body lotion, applied right after bath time, can help moderate cases of dry skin. Give special care to rough elbows, knees, and heels. With diligent care and the help of medical professionals, the elderly and their caregivers can successfully prevent and manage the varying skin conditions that may arise. Besides following the diet for your skin type, these foods are terrific skin-enhancers: leafy green vegetables; easily digested proteins such as panir, milk, tofu, sunflower seeds; foods high in zinc such as quinoa; and betacarotene-rich foods such as carrots and sweet cherries. Almonds and walnuts support the skin with their protein and lubricating fat content. Some skin-friendly spices include turmeric, which nurtures the different layers of the skin; cumin, which rids the body of ama ; black pepper to cleanse the channels, and fennel to balance the transformational ability of the skin. All antioxidant-rich fruits and vegetables, such as pomegranate, apple, pear, and bitter, green leafy vegetables are also excellent for the skin. Eat only intelligent foods, which are fresh foods, organic foods. Stay away from packaged, canned, frozen, processed, and packaged foods. Leftovers are also a no-no. Some nutritional supplements that are nourishing for the skin are Premium Amla Berry, which is rich in Vitamin C. Radiant Skin tablets are targeted to enhance the radiance of skin and keep it clear, while Youthful Skin Tablets combat the aging process by providing deep nourishment.